Because of the crazy of the season - I've somehow gone 6 weeks without a doctor's appointment so I'm excited to have an appointment this Friday to make sure we are doing good. It's also my glucose test so I'm hoping I pass! 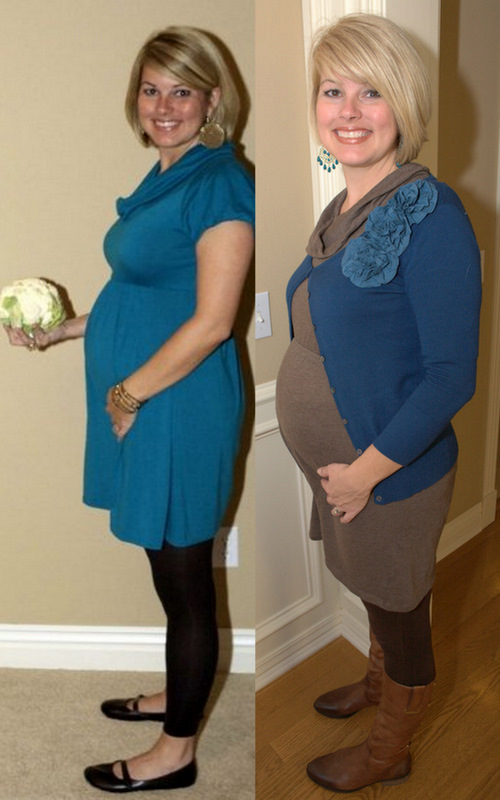 Funny that I'm wearing blue in both of these pics. I didn't plan that! ha! Harper has a lot of cute Christmas outfits and we are starting to break those out this week. I want her to wear everything at least twice over the next month! So I have to show y'all! Scott said she looked like one of Santa's elves today! ha! I thought she looked precious this morning before we headed out to Bible Study. She has a couple of stuffed lambs that she calls "Lamby" and she wanted to take this one to church today. I thought it would be cute for her to pose with an ornament. Until she broke it. ha! I have a couple of give aways going on and I'll post all those winners tomorrow. I'm slow!